Spain’s socialist government and the Catalan pro-independence parties have accused each other of breaking off negotiations aimed at easing the secession crisis. 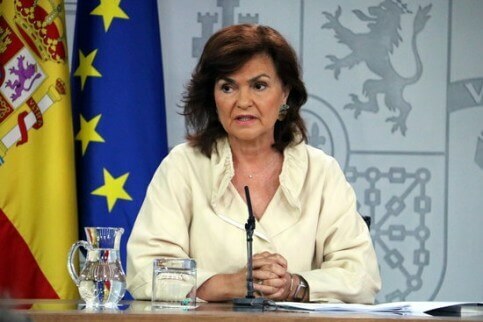 The mutual accusations came after Madrid’s latest proposal for talks caused an uproar among right-wing parties and some socialist leaders, who accused the government of making a concession to Catalan pro-independence leaders and thus yielding to their ‘blackmail’. The issue is sensitive in Spain where many reject any leniency towards Catalan leaders who still want independence like their predecessors who tried to secede in October 2017, while Madrid stresses dialogue is crucial to ease tensions. Madrid offered to create a roundtable attended by all political parties in Catalonia to try and ease the secession crisis in this northeastern region, complete with a special, independent ‘rapporteur’. ‘This proposal was an attempt to set the dialogue in an ordered, rigorous way, and with conviction,’ Deputy Prime Minister Carmen Calvo told reporters. She said ‘it was not accepted’ by the Catalan pro-independence parties. She added that separatist parties were asking the government to agree to holding an independence referendum, something which she said would ‘never be acceptable’. ‘When two parties have positions that are so irreconcilable, then you just have to stop. There’s no other solution,’ she said. In a hastily-convened press conference, Catalonia’s pro-independence government retorted that on the contrary, Madrid had ‘broken’ the dialogue. ‘It is the state government that has broken and abandoned the space for dialogue. We didn’t do it,’ said Catalan vice-president Pere Aragones. Right-wing forces have called a major demonstration in Madrid for Sunday to protest against Prime Minister Pedro Sánchez, just two days before the trial of 12 pro-independence leaders opens in the Spanish capital under the domestic and foreign spotlight. Sánchez heads up a minority government, with his socialist party having just 84 lawmakers out of 350. He therefore needs the votes of Catalan pro-independence lawmakers – alongside others – to approve his 2019 budget and remain in power until the next general elections planned for 2020. Terms & Conditions For editorial and collaboration enquiries please email: editorial@spainenglish.com All the opinions and views expressed in our 'Opinions, Blogs & Spanish Experiences' section do not necessarily reflect the views of 'Spain in English' or the Maravilla Media Group. All rights reserved. @2018 - spainenglish.com & Maravilla Media Group. All Rights Reserved.